Hello again, everyone, and welcome by again today as we wrap up our fabulous new August Release at Paper Sweeties. I hope that by now you are familiar with this SWEET new Congrats Stamp Set and coordinating Congrats Sweet Cuts that I've used and showcased the last few days. I also hope you've been visiting all my talented teammates to see their inspirations, and that you've stopped by the Paper Sweeties Blog to link up in our CHALLENGE for your chance to win the $100 grand prize. There's SO much excitement happening at Paper Sweeties this month, and you won't want to miss thing. 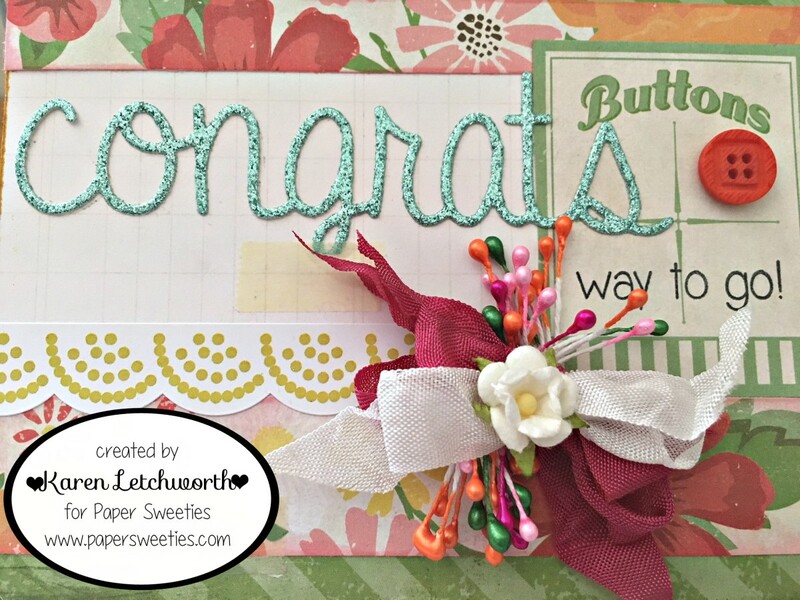 I used the new Congrats Sweet Cuts to create the focal point (congrats sentiment) by cutting it out of a thick glitter paper. 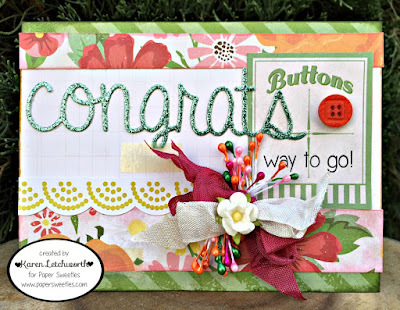 I placed it on my patterned paper (slightly crooked, sadly) and then I used the coordinating Congrats Stamp Set to stamp the other sentiment (way to go) on the little button card. Everything else is pretty much just patterned papers. At the bottom of my card, I added a bow that's made with Strawberry Seam Binding and Frosting Seam Binding topped with some stamens and a sweetheart blossom. Paper Sweeties carries approximately 18 colors of Seam Binding, and they are all gorgeous! Below you will find the links to the blogs of all my talented teammates from Paper Sweeties who have prepared something inspirational for you today, and I hope you will visit each of them. Thanks again for visiting us, and please stop by again soon. Paper Sweeties always carries everything sweet, adorable and precious to help you create something special. And don't forget to join us for the big CELEBRATION taking place on the Paper Sweeties Blog as we celebrate our 6th Birthday! Who knows....you could be the big $100 winner at Paper Sweeties this month. 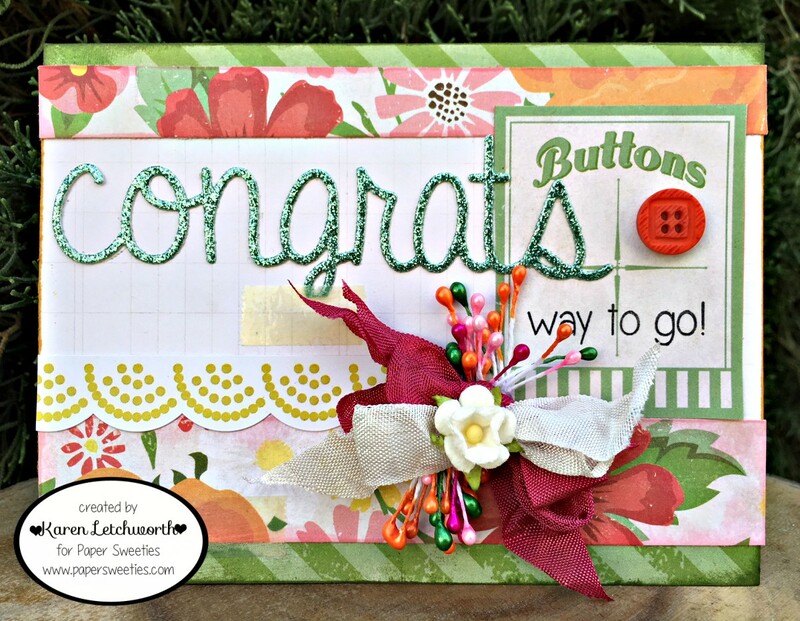 Creative Knockouts Challenge Blog - Challenge #259 Sparkle & Shine With Sweet 'n Sassy Stamps. For my "sparkle and shine", I used glittery paper to die-cut the (congrats) sentiment. 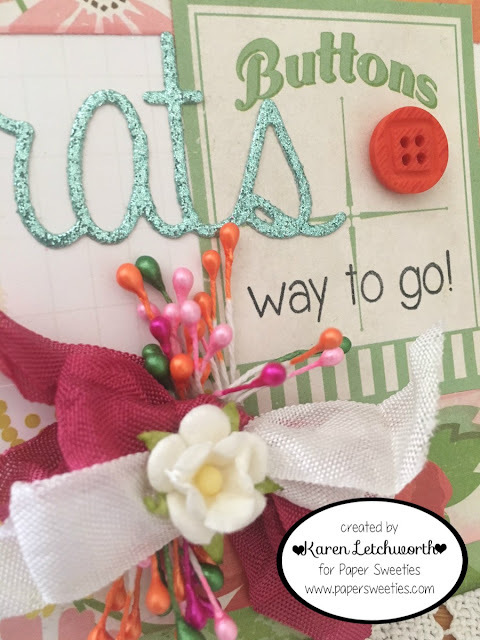 Another adorable card Karen - love that word die - large but not overpowering! This card is "sew" crafty! Love it!